The terrific website Vocabulary.com has been out for several years now, and it just keeps getting better. This is a product of Thinkmap, the group that created Visual Thesaurus (the free sections of which will be discussed in a future post). Text (of definitions) from Vocabulary.com (http://www.vocabulary.com), Copyright ©1998-2013 Thinkmap, Inc. All rights reserved. You might call it a dictionary with witty definitions. You might call it an advanced vocabulary game that can quiz you on up to thousands of words by definition, example usage, and spelling, and keep track of which ones you’ve mastered. You might call it a massive database of real examples of how words and phrases are actually used. You might call it a way to learn all the forms of a word and their relative frequencies of use in English. You might call it a resource full of useful wordlists that you can bookmark & learn. You might call it a great place to make your own vocabulary lists and quiz yourself on them. For now, there are no ads, and signing up for an account is free. Try these steps–then share a link to your wordlist here in a comment. 1. Create a free account and let the system quiz you a little bit—you’ll see it quickly adapt to your vocabulary knowledge. 4. Paste in a text with challenging vocabulary for you: nytimes.com and npr.org are good resources for this step. 5. Click the green “GRAB VOCAB” button. 7. Click the blue “SAVE LIST” button. 8. You’ll now see your list! from here, click “edit” to change definitions, add notes, and select example usage from a database of dozens of recently published articles. You can also click on any word in your list to learn a lot more about it and to see oodles of examples. 9. 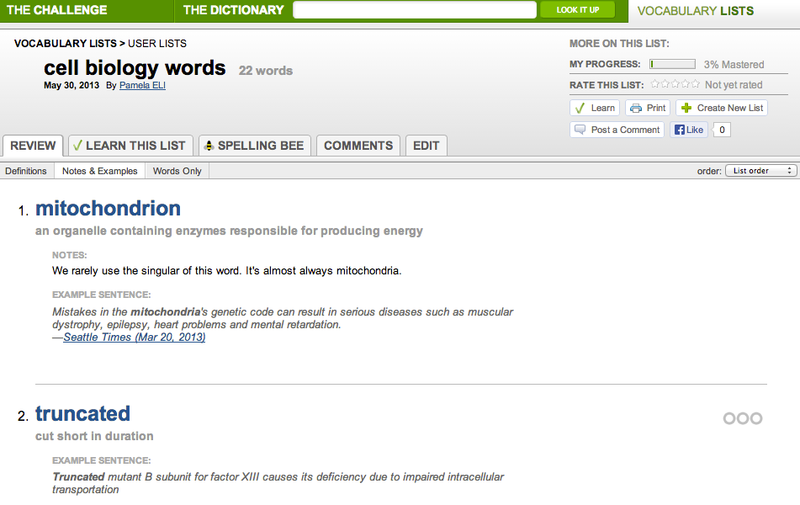 At any time, click the “LEARN THIS LIST” tab to be quizzed on your words. 10. Come back to this blog post and comment with a link to your cool new vocabulary list! You might also find the https://www.vocabulary.com/howitworks page helpful. There is a good FAQ (Frequently Asked Questions) page too. Categories: Suggested Websites | Tags: corpora, corpus, Dictionaries, Dictionary, thinkmap, usage, Visual Thesaurus, vocabulary, Vocabulary Lists, Vocabulary.com, Word, wordlist, wordnet | Permalink.